Strategic savanna burning is one way to reduce Australia's carbon emissions and create new markets in northern Australia, but the increased fuel load and emissions from weed infestations could make it unfeasible. Dr Vanessa Adams says that late dry season wildfires in Australia's tropical north generate about 3% of the country's annual greenhouse gas emissions, so strategic burning could be an important abatement activity. "But when native savannas are invaded by weeds such as gamba grass, fuel loads are dramatically increased and fires can burn up to five times hotter than a native wildfire," Dr Adams said. "We examined the spatial and financial extent of the threat of gamba grass and found that 75% of the area across northern Australia suitable for savanna burning is also highly suitable for gamba grass. "There's a large disparity between the profits generated from savanna burning - $1.92 per hectare – and the costs of managing gamba grass - $40 per hectare – meaning that much more savanna needs to be enrolled for carbon farming to cover the costs of weed eradication. 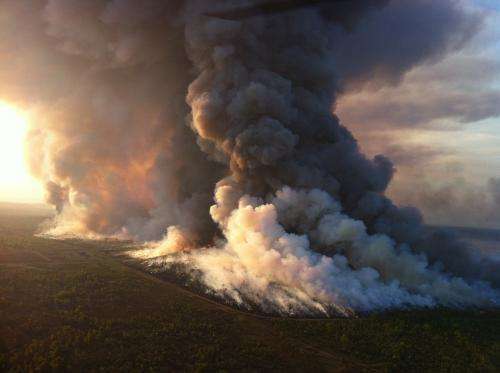 "The good news is that in the Northern Territory, only about 20% of properties that could run profitable savanna burning programs had gamba grass, and of these, about 16% had small infestations. "A one-off investment of $200,000 would eradicate these infestations, and for the majority of properties that are gamba free, an effective control program would safeguard them into the future. "It's really important we look at how these types of barriers might prevent landholders from getting involved in environmental offset programs and that we strategically manage weeds so that they don't become an intractable problem in the future." The study is available online in the Environmental Research Letters journal, and there is also a short video available.